Spend a night under the sea! 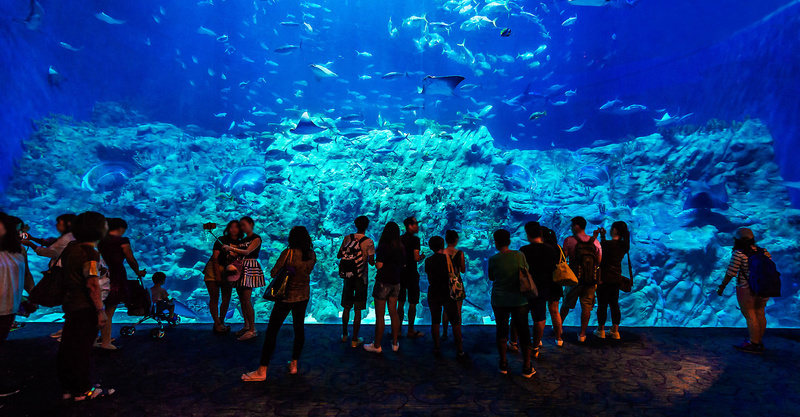 Bring your whole family to explore the ocean's depths with this special programme that features nighttime adventures, educational walk and delectable delicacies! 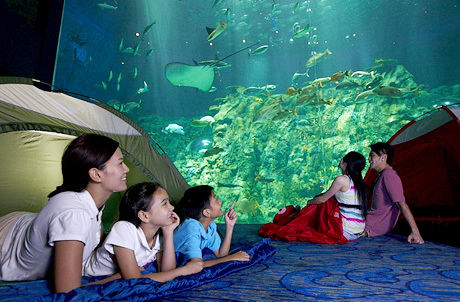 Spend the night inside the world-class Grand Aquarium and unveil the mysterious nighttime world of the sea bed! Treat yourself to delicious meals at Neptune's Restaurant and Club Panda as well! Let the ocean open your eyes! 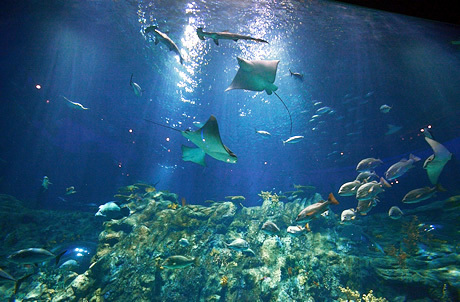 Visit the facilities at the Grand Aquarium with us and get to know spectacular coastal creatures! 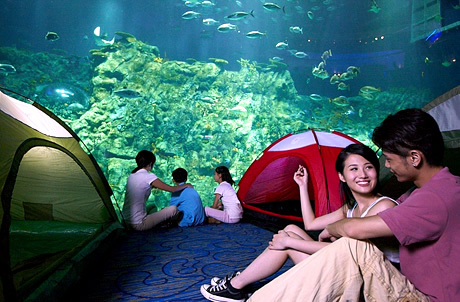 View over 5,000 fish overnight and let the fish accompany you after discovering about the diversity of the ocean! Theme restaurants at your service! Enjoy an exquisite dinner with an amazing view of the Grand Aquarium's main tank at our specially themed Neptune's Restaurant! The next day, have a refreshing breakfast with your kids at Club Panda! 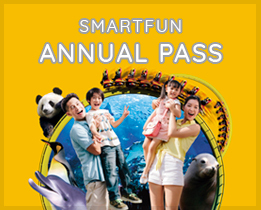 #Enjoy a 25% discount on daytime admission tickets after the programme and continue to explore the fun Ocean Park has in store for you! Participants under the age of 18 must be accompanied by a paying parent/guardian who satisfies all programme requirements. Cantonese, supplemented by English or Putonghua. Bilingual sessions can be arranged upon request at application. No booking from July to October. The programme is suitable for children aged 3 or above and their parent/guardian. However, participants who are under the age of 18 years old must be accompanied by a paying parent/guardianRemark 1who satisfies all programme requirements. Participants who are suffering from any disease (including, but not limited to, fever, coughing, cold/flu, skin disease, fainting/giddiness/loss of consciousness when in close contact with animals, phobia of water or animals, allergy to fish or depressed immune mechanisms), under the influence of medication and/or alcohol are not recommended to participate in this programme. The programme will mainly be conducted in Cantonese supplemented with English. English-speaking session can be arranged upon request at time of application. Participants must not be suffering from any infectious diseaseRemark 2specified in the First Schedule to the Prevention and Control of Disease Ordinance (Cap 599 of the laws of Hong Kong). To safeguard all participants, sick participants are requested to stay home. Ocean Park reserves the right to request the sick participants to leave the programme in case of such necessities. If a situation arises where a participant threatens the safety or security of himself/herself or another participant, or if a participant shows disregard for programme guidelines, the participant may be dismissed from the programme at the discretion of Ocean Park. The participating parent/guardian shall have responsibility for the child's safety and behaviour at all times and is obliged to conduct himself or herself in such manner so as to achieve this. The Park will not be responsible for any costs associated with a participant's dismissal on the grounds of disruptive behaviour. Participants shall not behave otherwise than in an orderly manner in Ocean Park or behave in an obscene or indecent manner. A condition of entry is to comply with all the park's By-laws and safety rules which are available at the entrances of Ocean Park. Ocean Park shall be under no liability or responsibility for any loss of any kind or any damage to any property of any person in the Park. Participants must at all times strictly follow all the instructions given by the Park's staff and to the satisfaction of the staff giving the instruction. The criteria listed above are subjected to change at the discretion of the Park and without prior notice. Reservations can be made via enrolment form at least 30 days in advance of programme date. Applicants will be notified of their results within 7 working days upon receipt of a completed enrolment form. The programme fee must be settled at least 5 working days before programme date. The programme date chosen cannot be changed upon confirmation, except under the circumstances stated in Session III. All payment made are non-transferable and non-refundable. Programme fee includes dinner and breakfast of next day. Should the participant have any food allergy, special medical condition or require special attention, please state on the application form. Application will not be accepted if the meal requested cannot be arranged, or the special request exceeds the operational scope of Ocean Park. Please arrive at the gathering point punctually. Late-comer might not be admitted to the programme. Participant's name, confirmation letter and the credit card used for payment should be presented for verification on the date of visit. All participants are not allowed to leave the group without a prior approval from the instructor. It is highly recommended that no valuable items should be brought to the Park. Ocean Park shall be under no liability or responsibility for any loss or any damage to the property of any participant in the Park. Tent, sleeping bag and mattress will be provided by the Park. Participants could bring their own if necessary. All participants are recommended to wear causal out-fit and bring daily necessities (e.g. tooth brush, toothpaste), a bottle of water, hat/cap, sunscreen lotion, umbrella and mosquito repellent. Participant may also bring along pillow and warm clothes if necessary. Please note that changing room and shower facilities are not available in the Park. It is prohibited to take photo, video or use mobile phone at the back-of-house of all animal facilities. The stay-behind fee for the next day is not included in the programme fee. If participant would like to stay-behind after the programme, he/she can enjoy a special price by specifying in the application form. Decision for immediate cancellation of the Programme at sole discretion of the Executive Director of Zoological Operations & Education Division of the Park or his/her delegate. Programme may be re-scheduled or refunded for the affected participants under the above mentioned circumstances. Reservations can be made via submitting the enrolment form at least 30 days before programme date. Applicants will be notified of the results within 7 working days upon the recipient of a completed enrolment form. The programme fee must be settled at least 5 working days before programme date. 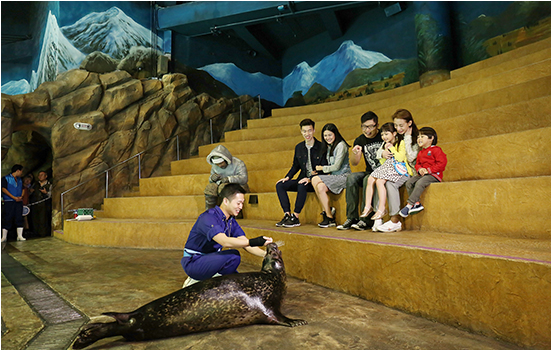 To enroll the programme, please complete the enrolment form and email to uniqueexperience@oceanpark.com.hk or by fax to (852) 2553 4483. Please contact Ocean Park Discovery & Education Department staff at (852) 3923 2323 (select the language and press ) if you do not receive any notification.